It’s Fat Tuesday! It’s Mardi Gras! I live a loooong way from New Orleans but we can party from afar don’t ya think? Well, I don’t have any fancy parties to go to but maybe me and my boys will get some Mardi Gras beads from Party City and have a dance party while Dads at school. haha! My kids would love that! Any reason to have a celebration right? Anyway, today I wanted to share with you my little bathroom. It’s a tiny little thing but it fits our needs just fine. Since it’s such a small space, I wanted it clean and simple. 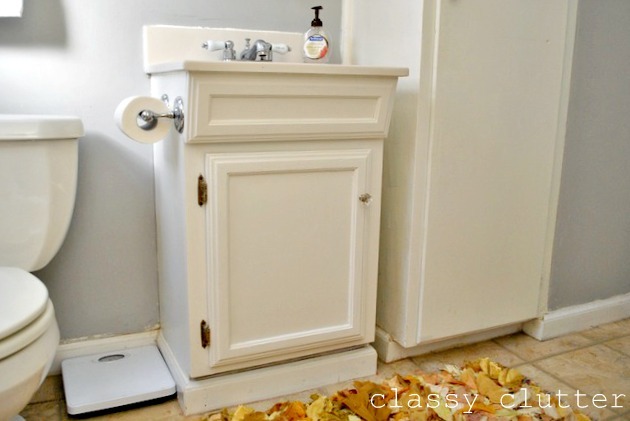 I’m not a fan of bathroom extras unless you have the space for it. I like my bathroom decorated just a little but squeaky clean! This was my original idea for the bathroom. I went that direction for most of it. I ditched the idea of the curtain/window treatment because the window lets in so much light that we rarely need the bathroom light on, except at night of course. I love the sunshine through the window so I opted to leave the window bare with just the blinds. 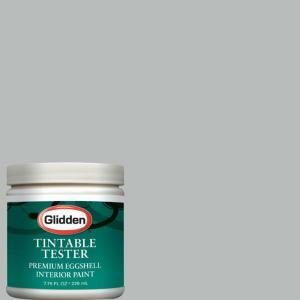 The paint color is Glidden Pebble Grey. It’s the same color as my living room and my hallway. I got my rug from Urban Outiftters and I love it lots! I have had to throw it in the wash a few times and it’s done just fine. I love the color and texture of it! You can get it at Urban Outfitters for $29. They have other colors too! I hung my “You make me happy when skies are grey” printable above the towel bar for some easy artwork. 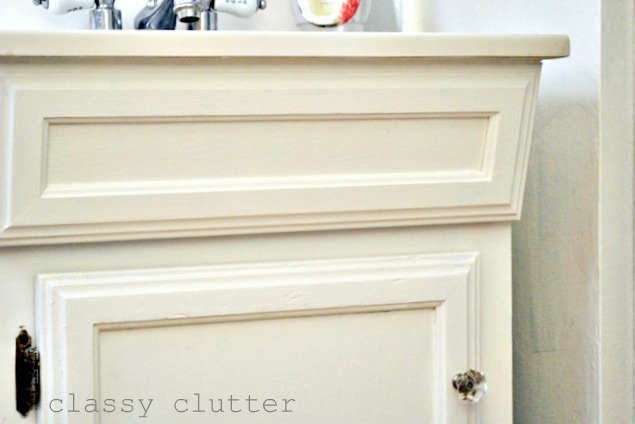 Finally, I update the vanity and built in cabinets with some white paint (Behr Swiss Coffee) and a new knob on the vanity to dress ‘er up a bit! What do you think? Are you a yellow fan? Do you like it? Love, love, love it! 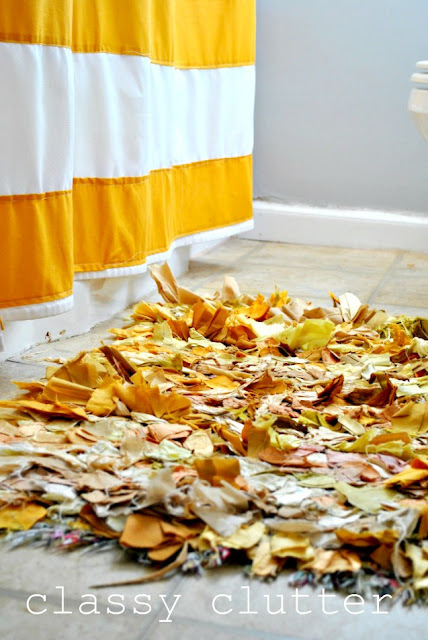 The rug has the colors of fall leaves- and that printable- too cute! 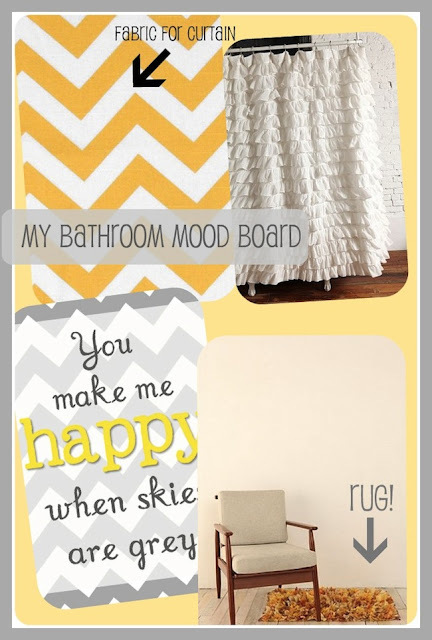 I love yellow and gray together! This is so great! Mallory, I JUST finished painting my first floor hallway yellow. It’s like instant sunshine, isn’t it? So pretty. I love gray and yellow. fun and simple! yellow is the BEST! Looks really nice. I like the unexpectedness of the rug and the happy stripes with the crisp gray. Lovely. Love the color combination and that rug is so much fun! Great update! love it!! You’re pictures look amazing!! So bright and cheery! Bathroom looks great. I would say it was very hard to applique those stripes on, a bigger project than I could imagine. Saw your post at Tip Junkie. Thanks for sharing. It’s looking really good! Can’t wait to see it completely finished! whoa love everything about this! looks great! i love how calming it is! I love the gray! I am going to have to find somewhere to put it in my house! Gorgeous! I’ve been crushing on gray and yellow lately. 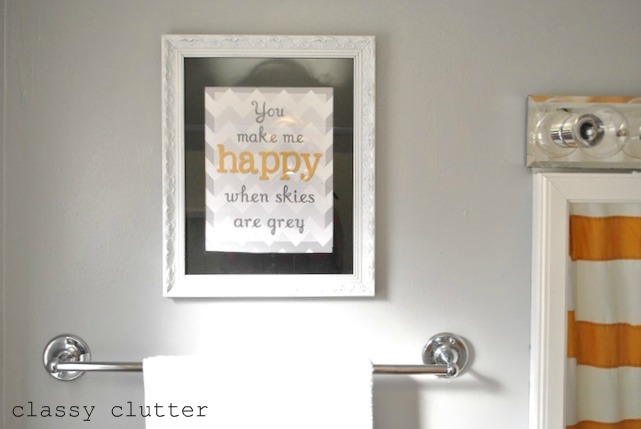 I’m putting your pretty makeover in Domestically Speaking’s PoPP Spotlight. Thanks for linking up. LOVE! 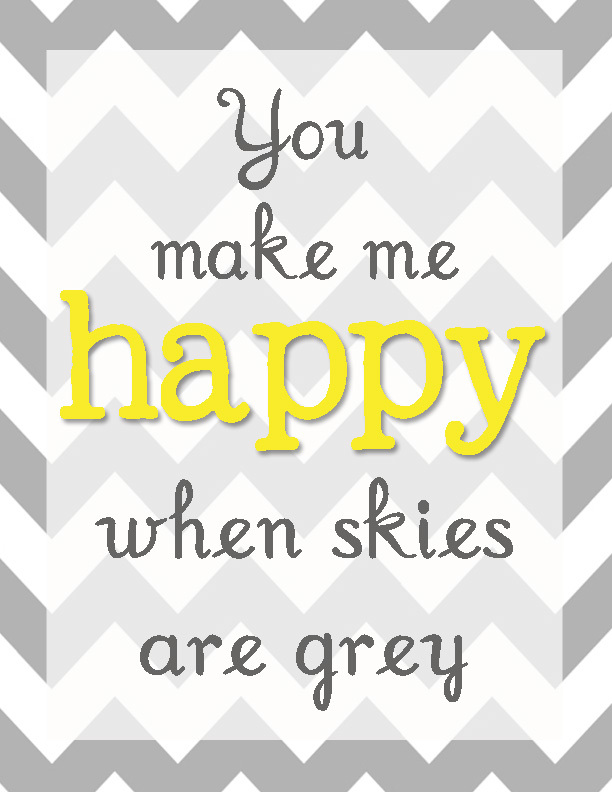 I just love the grey and yellow together! They are so perfect together! 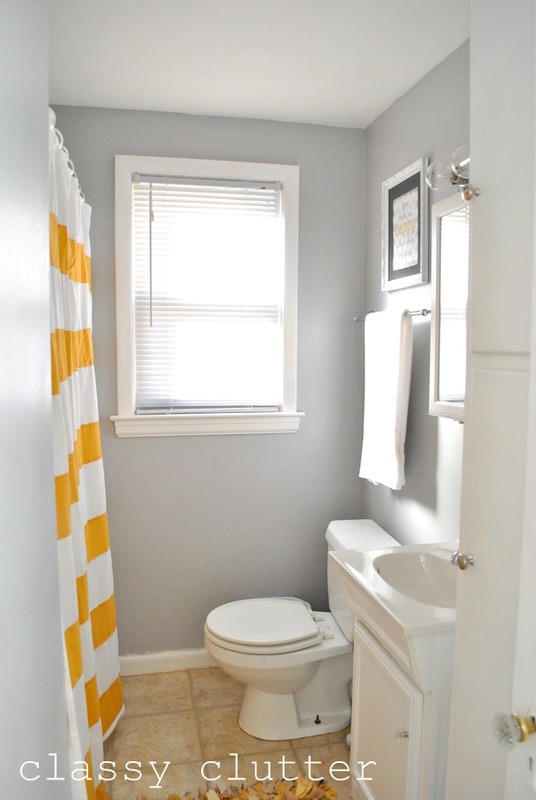 i love the yellow and grey color combo! 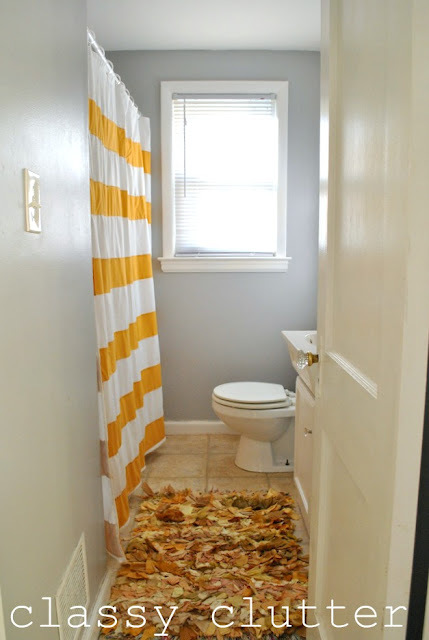 i’m planning on a redo for our small bath. yours turned out really well. and, the rug? i love it! Where did you get that shower curtain? I love the stripes! Lovely share. I get so many ideas. visiting from Lil Luna ilk party. LOVE That rug! Everything looks so crisp and clean. Great job! I love the way it turned out. ..so cute! How does the paint look in person? Does it read taupe/tanning or is it blue grey ? I really love the way you do it. Very creative. I will try to do this at home at place it on our bathroom. Nice way of decluttering and recycling. Cheers.